The 96-Well CometChip® System is a high-throughput platform developed to simultaneously treat and measure DNA damage induced by different treatments, or among different cell types on a single slide using the Comet assay. The CometChip is based upon the well-established single cell gel electrophoresis Comet Assay, which estimates the level of DNA damage by evaluating the extent of DNA migration through a matrix in an electrical field. The type of damage measured by this assay includes abasic sites, crosslinks, and strand breaks. 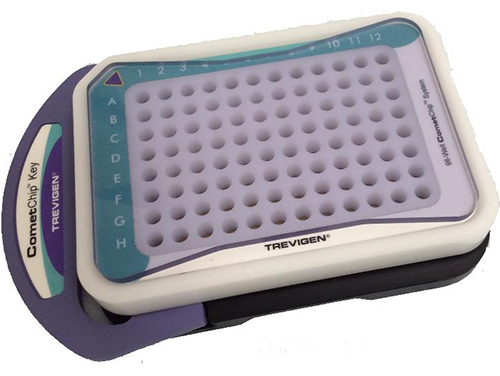 A single 96-well assay can produce 20,000 data points per chip, based on an average of 208 cells imaged per well. With a capacity for three chips per run, the output for just two runs per day is 120,000 data points. This system enables reproducible and sensitive measurements of DNA damage in human cells and provides the necessary throughput for genotoxicity testing, drug development, epidemiological studies, and clinical assays.